The Sacred Page: Breaking: "More Ancient Manuscripts Recovered!" Let's Just Wait and See. . . Breaking: "More Ancient Manuscripts Recovered!" Let's Just Wait and See. . .
Later, they were stolen and most were believed to have been smuggled into Israel. Jordan has demanded Israel return the manuscripts but has gotten no response. Okay, everyone. . . breathe. 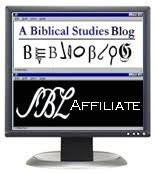 We just went down this route and, as I explained then, after the dust settled the "find" of was exposed as a fake, thanks primarily to work of academic Bible bloggers ("bibliobloggers"). In fact, this report sounds very similar to that story, making me wonder if the manuscripts in question are in fact related to that con-job. The story says tests are being done. . . let's just wait and see about that. Remember: real scholarship is presented in peer-reviewed journals and conferences and not simply in press conferences. H/T Jim Davilia, who in turn tips his hat to Joseph Lauer. I suspect this is not just a similar story but the same story, or an update on it. The details seem almost the same as in this BBC report from March. Usually by "manuscripts" we think of something on papyrus, parchment etc, but it would hardly be surprising if AP used the word for books written by hand on lead tablets.